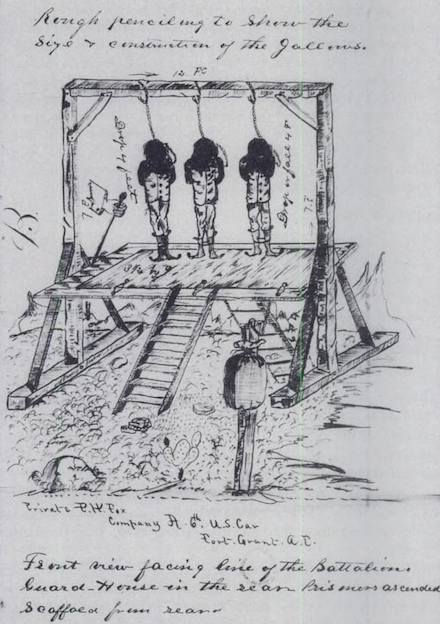 On this date in 1882,* the U.S. Army hanged three White Mountain Apache scouts as mutineers. 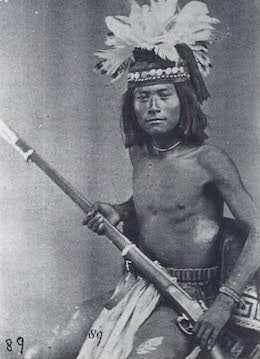 This small tragedy in the long-running Apache Wars of the American Southwest had its seeds in the 1870s, when the Army forced onto the San Carlos reservation several bands of Apache peoples, including the Chiricahua, Yavapai, and the Western Apache nations of Tonto, White Mountain, and Cibecue. The concentration proved potent, unexpectedly so since the tribes in question were not all on friendly terms with one another. Noch-ay-del-klinne (many other transliterations are possible), an influential White Mountain medicine man of 36 summers or so — and a man who had been to Washington DC with a peace delegation and laid his own eyes on the encroaching industrial civilization — began cultivating something very like a ghost dance for the San Carlos Indians. Though the ghost dance is most closely associated with the Lakota Sioux, several years and several hundred kilometers’ distance from the Apache of Arizona, the movement actually originated among the much nearer Nevada Paiute. Incarnations of ghost dancing throughout the American West gave a millenial expression to indigenes’ shared trauma of defeat, displacement, and death. Noch-ay-del-klinne’s rituals were called Na’Ilde’, meaning raising from the dead,** and his prophesy that lost comrades would rise from their graves and the white man would vanish from Apache lands when the corn was ripe, spoke to that trauma for the denizens of the San Carlos reservation — and alarmed the U.S. Army troops stationed at nearby Fort Apache. Especially troubling was the “fraternizing that went on between tribes and elements of tribes which had always held for each other the most deadly aversion,” in the words of the later memoir of Thomas Cruse, who commanded the army’s company of native Apache scouts. He had granted leave for some of his scouts to attend these dances and didn’t like what he saw when they returned. After the medicine dances began around the post I noticed a change. Generally they [the scouts] are very ready to communicate anything they know or may have seen, but after these dances they became very uncommunicative and would not tell anything that was going on among the other Indians or among themselves … when they came back they were not only exhausted and unfit for duty, but they showed surliness and insubordination. They grumbled constantly and made vague remarks about the country being theirs, not ours. Dozens of small incidents showed that something, or someone, was giving them new thoughts. This incursion, which will set in motion dozens of untimely deaths, was entirely aggressive, justified by no act of overt hostility by the Apache. Although Cruse was writing many years after the fact, his complaints about his subalterns’ “surliness” and “new thoughts” have the ring of the boss’s know-your-placeism, as directed in this same period at social insubordination elsewhere in the American experiment — at organized labor, for example; or at Black men and women. Whether upon an arranged signal or merely the alert of the sort of random confrontation this situation invited, those Apaches started firing at the army camp — and as Cruse had anticipated, his scouts in the breach adhered to their people, not the flag. Before leaving the field Colonel Carr sent Lieutenant Carter to examine the body of the Medicine Man and determine if life was extinct. Strange to say, notwithstanding his wounds [he’d been shot in the head -ed. ], he was still alive. The recovery of this Indian, if left in the hands of his friends, would have given him a commanding influence over these superstitious people, which would have resulted in endless war. Colonel Carr then repeated the order for his death, specifying that no more shots should be fired. Guide Burns was directed to carry out the order with the understanding that a knife was to be used. Burns, fearing failure, took an ax and crushed the forehead of the deluded fanatic, and from this time forward every person murdered by these Apaches was treated in a similar manner. Carr’s bloodied expedition proceeded that night upon a forced march for the safety of Fort Apache, reaching it the following afternoon — although “many of the Indians had preceded the command, and all night they were haranguing in the vicinity. They covered the roads and trails, and killed a number of citizens.” The fort came under a brief siege in the ensuing days, and hostilities in the resulting regional uprising dragged on for two years, concluding with the outcome customary for the Apache Wars. Wagons of all descriptions loaded with men anxious to see the execution of the Indian scouts, Dead Shot, Dandy Jim and Skippy, came pouring into this place from Wilcox, Thomas, Safford and all points from very early this morning. The time not being known at which the event would take place, there was a state of suspense until the moment arrived for the execution. The gallows was erected in front of the guard house and was fourteen feet high, with a platform six feet four inches from the ground and a distance of seven feet four inches from the floor to the gallows pole. The whole measured twelve feet in length by eight feet wide. The rope used was three-quarters of an inch thick and the drop was four feet six inches. Dandy Jim, from this forum thread. [On the scaffold] Dead Shot said he had nothing to say. What was being done was correct. He would probably meet his people. He had suffered much in this world and now he was through and would see his people. Since he first saw white men he had been well treated. He had plenty to eat and plenty of clothes, but this day paid for all he got from the white men. He also said Dandy Jim was a nephew and Eskiticha, or “Skippy,” a cousin of his. He had seen a good many of his people die and did not know where they went, but he was going to follow. He thought there was no use in dressing an Indian up as he was and then hanging him. When he came into San Carlos, if he had done anything wrong, he would not have given himself up, yet he gave up his rifle and the twenty rounds of ammunition that were furnished him at Camp Apache. Dandy Jim said he had to be hanged, as such were the orders. He could not talk much. It was no use to beg for his life, as people would only laugh at him for his trouble. Eskiticha said: — “The sun is going down, and God is looking after me.” He did not think they were doing right, as he had never done anything to warrant being hanged. The chaplain, Rev. A.D. Mitchell, then repeated a short prayer, which was interpreted by Merijilda, when all retired from the scaffold, except the hangman, a military prisoner. The black caps were then placed over the heads of the men, and at one o’clock the drop fell. Death was instantaneous in the case of Dead Shot and Eskiticha; Dandy Jim quivered once or twice. After being allowed to hang about twenty minutes they were cut down and pronounced dead by the doctors. * The same date as an unrelated Mississippi double hanging, previously covered in these pages. ** According to John R. Welch, Chip Colwell-Chanthaphonh and Mark Altaha in “Retracing the Battle of Cibecue: Western Apache, Documentary, and Archaeological Interpretations,” Kiva, Winter 2005. Noch-ay-del-klinne had some exposure to Christian doctrine, which seems present in his own movement’s interest in resurrection. † Also in the scouting party for this mission was famed frontiersman and eventual Executed Today client Tom Horn. ‡ Thomas Friday’s full account of this affair — which is a second-hand version, since Friday himself was a small child at this time — comes courtesy of William B. Kessel in “The Battle of Cibecue and Its Aftermath: A White Mountain Apache’s Account,” Ethnohistory, Spring 1974. The retaliatory executions a U.S. Army lieutenant carried out on this date in 1861 helped set in motion a decade-long war with the Apaches. Since nobody was present at the time, the identity of the raiders just wasn’t known — but someone’s suspicions affixed on the wily and dangerous* Chiricahua warrior Cochise. The Chiriachuas were just one group among the Apache peoples; they ranged from Mexico to southeastern New Mexico and southwestern Arizona, and were divided into many small local groups each with their own leader — like Cochise. The greenhorn lieutenant rode out with 54 cavalrymen to Apache Pass and lured Cochise to a confabulation. Cochise showed up with his brother, wife, and children — clearly expecting some sort of social call. Author’s overview of The Wrath of Cochise: The Bascom Affair and the Origins of the Apache Wars. Cochise was entirely unaware of the kidnapping, and unaware that Bascom considered him the kidnapper. He offered to find out about it and retrieve the boy from whomever had him. 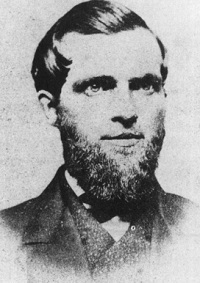 Bascom, whose troops had surrounded the tent during the parley, accused Cochise of lying to him. Cochise had twice the impertinent lieutnant’s years and at least that multiple of Bascom’s sense, and must have been affronted by his opposite number’s behavior — but when Bascom announced that he would be taking Cochise and his companions as prisoners pending the return of the raiders’ spoils, the Apache commander whipped a knife out of its sheath and instantly slashed his escape route through the wall of the tent. Bursting past the shocked troops (they were as inexperienced as their officer), Cochise escaped into the twilight. This “Bascom Affair” (to Anglos) is remembered more evocatively by Apaches as “Cut Through The Tent”. But the tent-knifing was only the start of it. Cochise’s party did not manage to follow his escape, so Bascom now held Cochise’s brother, wife, son, and two other warriors. The Apache tried to put himself in a negotiating position by seizing hostages of his own — first a Butterfield stagecoach stationmaster named Wallace, and later three white men seized from a passing wagon train. Nor were the hostages’ the only lives at stake. Cochise’s band, including the soon-to-be-legendary Geronimo, had assembled and their campfires burned menacingly in the hills around the little stage station where Bascom’s force fortified themselves. Bascom could have defused it all with a hostage swap, but the kid had his orders and stubbornly refused to make the trade unless it included the one hostage Cochise didn’t have: that little boy from the ranch. A devastating decade-long war against Cochise and his equally able father-in-law Mangas Coloradas ensued, and right when the army most needed its military resources for the Civil War. The conflict claimed hundreds or thousands of lives, crippled mining and ranching, and depopulated fearful white settlements around Apache country in favor of “gravestones … by the road-side like sentinels, bearing the invariable description ‘Killed by the Apaches'”. A fort near the Texas border was later named for Bascom. The kidnapped boy was never recovered and grew up in a different Apache tribe. The events of, and following, the Bascom Affair were depicted on the silver screen in the 1950 Jimmy Stewart western Broken Arrow and its 1952 prequel Battle at Apache Pass — among many other cinematic adaptations. * Cochise was officially at peace with the Americans at this point and hostile to Mexicans. In “Cochise: Apache War Leader, 1858-1861,” in the Journal of Arizona History (Spring 1965), Barbara Ann Tyler argues that the reality of the situation was that his warband flexibly shifted between temporary peace and opportunistic small raids, moving north and south of the Mexican border as convenient. 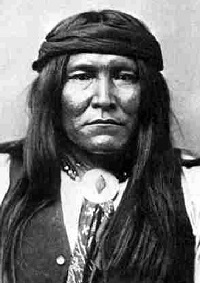 One hundred and fifty years ago, day to day,* the Apache chief Dasoda-hae — better known as Mangas Coloradas, “red sleeves” — was extrajudicially executed by U.S. Army soldiers at Fort McLane, New Mexico. He did his utmost to keep relations with the gigantic industrial society on his borders safely diplomatic, but over the 1850s Apaches spiraled into conflict with aggressive Anglo settlers drawn by the call of gold. In 1861 Mangas Coloradas married his daughter to another Apache chief, Cochise. These two were able to keep whites at bay with raids for a short time (and given a big assist from the resource diversion of the Civil War). But there was only one way this was going to end. In January 1863, Mangas Coloradas — about 70 years old and still alive to the impossibility of long-term success by force of arms — arrived under a flag of truce to negotiate a ceasefire with Brigadier General Joseph Rodman West. West had him clapped in irons instead, and let his soldiers know exactly how to handle their prisoner. Men, that old murderer has got away from every soldier command and has left a trail of blood for 500 miles on the old stage line. I want him dead or alive tomorrow morning, do you understand? I want him dead. That night, Mangas Coloradas was tortured with red-hot bayonets and shot “trying to escape.” The Apache Wars would expand calamitously in the years to come. The fate of this horrid trophy after it passed through Fowler’s hands is a mystery. It’s rumored that the Smithsonian received it, and perhaps surreptitiously got rid of it; while the institution has always denied ever having the skull of Mangas Coloradas, it is a fact that the Smithsonian collected and still possesses an alarmingly enormous trove of Native American remains.